PASADENA, Calif. – For all Jameis Winston had done as a redshirt freshman for Florida State, he never had to pull the Seminoles from the brink of defeat. The Bowl Championship Series went out with a bang, with one of the best title games in its 16-year history. And the Southeastern Conference’s seven-year winning streak in college football’s biggest game was snapped by the Atlantic Coast Conference school that played in the first three BCS title games but hadn’t been back since. Winston struggled much of the night but was near perfect when the Seminoles (14-0) needed it most, going 6 of 7 for 77 yards on the game-winning 80-yard drive. “It was the best football game he’s played all year,” Fisher said, “and I’ll tell you why, because for three quarters he was up and down and he fought. Winston was 20 of 35 for 237 yards with two fourth-quarter touchdown passes. He zipped the Seminoles down the field on the final drive, with help from a 49-yard catch-and-run from Rashad Green. Florida State also got a little help. 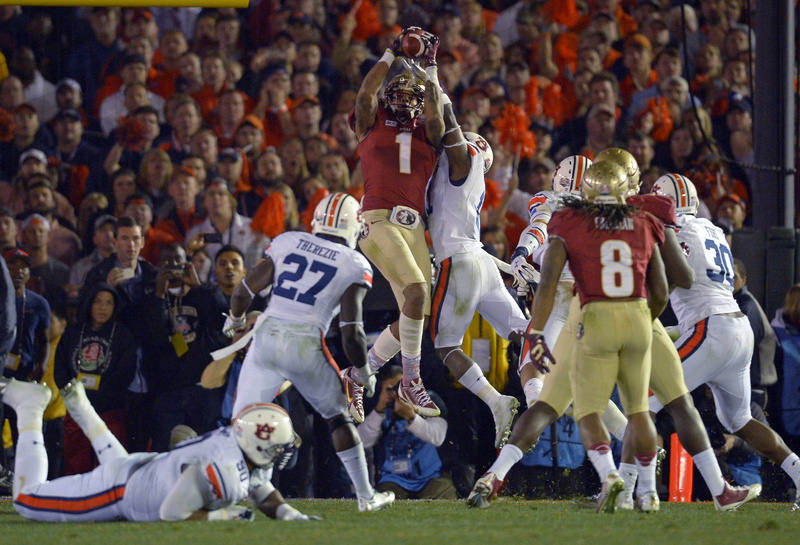 A pass interference penalty on Auburn’s Chris Davis on third-and-8 from the 10 gave Florida State a first down at the 2. On the next play, Winston flipped high to the 6-foot-5 Benjamin for the touchdown. Mason ran for 195 yards and Nick Marshall threw two TD passes for the Tigers. “I told them in the locker room, we put together the biggest turnaround in the history of college football. We were on the brink of making it one of those magical seasons,” Malzahn said. Florida State hadn’t been challenged like this all season, winning by an average of 42 points. Florida State and Winston’s biggest problem this season came off the field. Winston was investigated for a year-old sexual assault complaint in November, but after three weeks the Florida state attorney’s office determined it did not have enough evidence to charge him. And now Florida State is national champion for the first time since 1999, the first team to win the BCS title game after being behind at halftime. The Seminoles cut it to 21-10 with a late touchdown in the second quarter, following a faked punt and a tough 21-yard run by Winston, and chipped into Auburn’s lead with a 41-yard field goal by Roberto Aguayo with 6:05 left in the third quarter. Meanwhile, Florida State had found some answers to Auburn’s spread offense. A holding penalty that wiped out a long pass also helped keep the Tigers scoreless in the third quarter, and the Seminoles began the fourth with P.J. Williams intercepting Marshall’s pass and setting up Florida State at its 38. When Winston tossed in the flats to Chad Abram, who hurdled over a tackler on the way to an 11-yard touchdown, the lead was 21-19. Florida State was considering going for two to tie, but Devonta Freeman was flagged for unsportsmanlike conduct and that pushed the extra point back 15 yards and forced the Seminoles to kick for 21-20. And the stage was set for the frenetic finish.